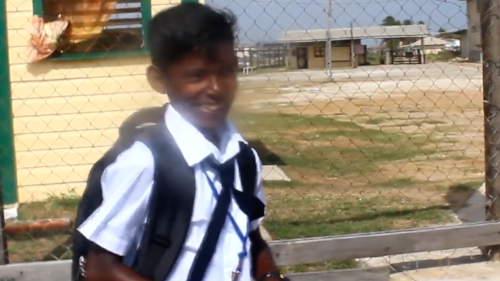 Meet Chetram Ramphal, this young teen was forced to drop out of school following the tragic death of his father on the Corentyne highway; Chetram's only wish now is to be able to get an education and take his family out of poverty. This story can bring anyone to tears, but this is a child with hope and potential, let's help him make his dream come true. At just 6 years old Chetram was a patient at the New Amsterdam Hospital, and during a trip to visit Chetram, his father was killed in a tragic motor vehicle accident, which took the lives of 12 individual. Since Chetram's father was the breadwinner of the family, they suffered not only with the devastating loss of their father, but also with grave financial distress. Chetram's mother tried as hard as possible to put food on the table as a domestic worker, but still could not make ends meet. And though villagers assisted the family of 5 with food, clothes and other necessities, they still struggled. As a result, Chetram was forced to drop out of school to help his mother by becoming a fisherman. He would leave home at 6:00am daily to venture out into the back-lands for his daily catch, this allowed them to eat, but not a chance at education. While the family plea for justice for their father, Chetram expressed his great desire for an education so that he can help his family out of poverty. It was his heartbreaking plea that caught the attention of SHEA's Tracey Khan and Lori Narine who took on the mission of assisting the family. They started a fundraiser where funds collected will be used to repair the family home, start a small business to help the family self-sustain, and set-up and education trust for Chetram. The trust will be paid as a monthly stipend to help further Chetram's education. Thank you to those who have generously donated and for the outpouring of support to assist this family. Please continue to donate to further assist this family.